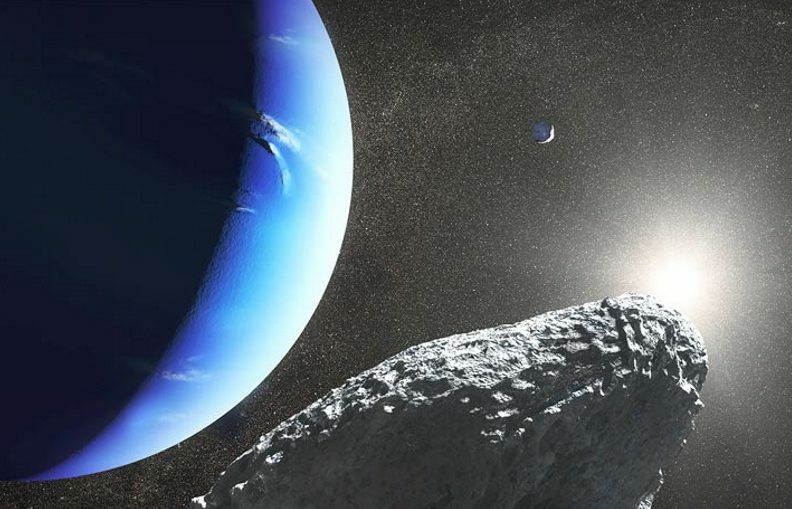 Neptune’s smallest moon may be a chunk of a neighboring moon that was knocked off by a comet. One of seven moons that orbit closer to Neptune than the planet’s largest moon, Triton, the newly dubbed Hippocamp is just roughly 34 kilometers across, researchers report in the Feb. 21 Nature. 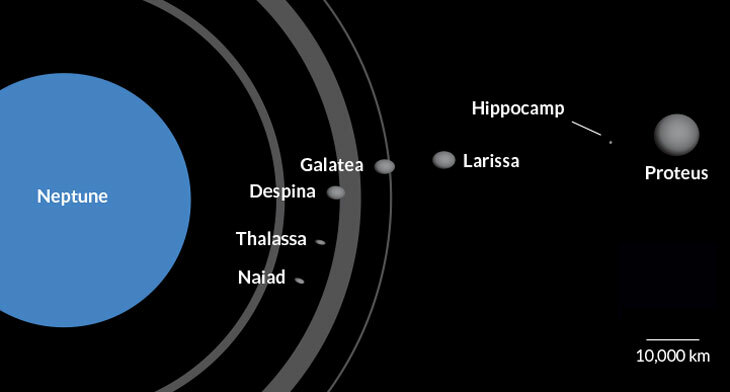 The second-largest moon, Proteus, is Hippocamp’s nearest neighbor, orbiting about 12,000 kilometers away. “Why would such a small moon be so close to such a big moon?” wondered astronomer Mark Showalter of the SETI Institute in Mountain View, Calif. He and his colleagues used more than a decade’s worth of observations with the Hubble Space Telescope to find the new moon, which was first reported in 2013 (SN Online: 7/16/13). Bigger moons tend to gobble up small ones as the moons form. Stranger still, the pair was probably even closer in the past, because the physics of their orbits suggests that Proteus is slowly migrating away from Neptune. Showalter thinks Hippocamp is a piece of Proteus that was chipped off by a massive collision with a comet. Proteus has a massive crater, called Pharos, which is so big that the impact that made it nearly broke Proteus apart. The collision could have kicked up a cloud of debris that eventually coalesced into a smaller moon. “They’re far away now, but they were part of the same object in the past,” Showalter says. The name Hippocamp references a half-horse, half-fish creature from Greek mythology, which pulled a chariot for the god Poseidon (the Roman Neptune). All of Neptune’s moons have names related to the sea in Greek and Roman mythology. That suits Showalter, who is a scuba diver. “The true story is, I’m very fond of sea horses,” he says.